DAYS AFTER DJ Bobby Ryan went missing gardaí searched the farmland where he would be found almost two years later, but found no evidence of what happened to him, a murder trial has heard. 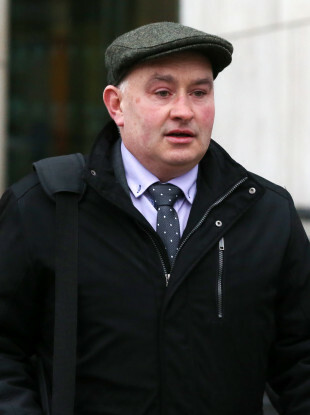 Farmer Patrick Quirke (50) of Breanshamore, Co Tipperary has pleaded not guilty to the murder of Bobby Ryan, a part-time DJ going by the name Mr Moonlight, on a date between 3 June 2011 and April 2013. He is on trial at the Central Criminal Court. The deceased went missing in June 2011 and his body was found in April 2013 in a disused waste water tank on a farm at Fawnagowan owned by his girlfriend Mary Lowry and farmed by Quirke. Sergeant Cathal Godfrey today told prosecution counsel David Humphries BL that he was in charge of a search of the land at Fawnagowan. Sergeant Godfrey said he knew that Mary Lowry had given a statement to gardaí saying that Ryan stayed at her home the night before he disappeared and left at about 6.30am. On 7 June 2011 Sgt Godfrey and several other gardaí searched a quarry, fields, tanks, ditches, hedges, farm buildings and sheds looking for anything that might assist in what was at that time a missing person enquiry. They found “nothing of evidential value”, he said. They did find a slurry tank but, he told Bernard Condon SC, defending, there was not enough material in it to hide a body. Frequent heavy rain interrupted the search, he said. Garda Michael Fitzgerald was part of the search party and told defence counsel Lorcan Staines SC that in one of the sheds they found a gold-coloured Toyota Corolla. It was dirty inside and out, he said, and the boot was open. He looked through the car but found nothing. The trial has previously heard that Bobby Ryan bought the Toyota Corolla for Mary Lowry’s sons as a “field car” for driving through the fields. Each of the gardaí giving evidence told Staines they did not take photographs of what they saw during the search. Garda Tom Neville told Humphries he was in Tipperary Garda Station when Michelle Ryan, daughter of the deceased, came to report that her dad was missing. That afternoon Garda Neville was on his way to Mary Lowry’s home as part of the missing person investigation when he received a call to say that Ryan’s van had been found at a carpark leading into the nearby Kilshane Woods, so he went there instead. He and his colleague were the first gardaí at the scene and on arrival, they discovered that Michelle was in the woods searching for her father. Mary Lowry was alone in the car park and she told Garda Neville that she had opened the rear door of the van looking for Ryan. The trial continues in front of Justice Eileen Creedon and a jury of six men and six women. Email “Gardaí searched lands where DJ Bobby Ryan's body was found but discovered nothing, court hears ”. Feedback on “Gardaí searched lands where DJ Bobby Ryan's body was found but discovered nothing, court hears ”.